In 2009, Cambridge Memorial Hospital was designated as a Best Practice Spotlight Organization (BPSO) by the Registered Nurses Association of Ontario (RNAO). Since that time, we have implemented seventeen Best Practice Guidelines. These guidelines promote and support quality care for our patients and families. The guidelines also contribute to healthy work environments for our staff and encourage the use of the most current evidence in day-to-day practice. Click to visit the Registered Nurses Association of Ontario website. Please click each title below to learn more. 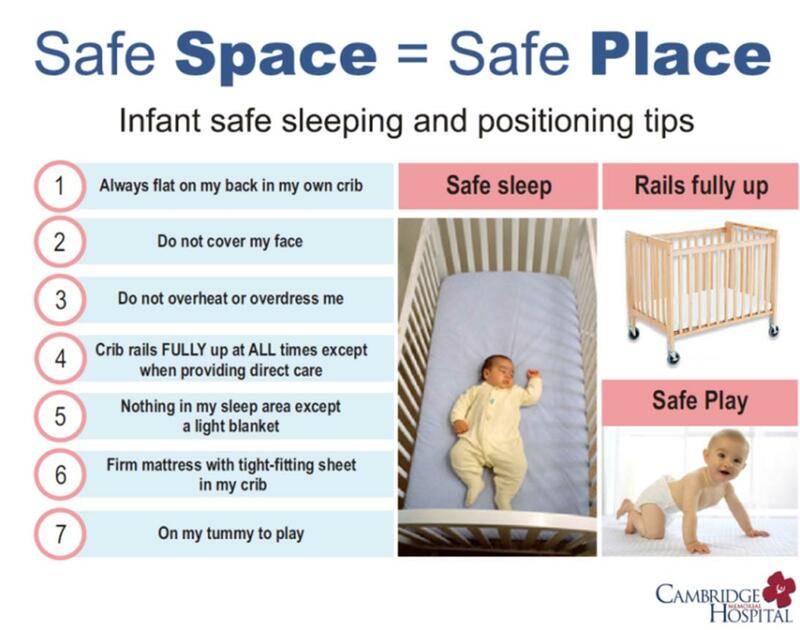 This guideline includes best practices for ensuring infant safe sleep is practiced and taught to parents/caregivers. The Safe Sleep BPG encompasses the environment, feeding, caregivers, and prevention and identification of risk factors. The goal is to avoid SIDS (Sudden Infant Death Syndrome). Please see below for more information and resources. This guideline has been implemented to help identify adults who are at risk for falling. This guideline has recommendations to reduce the number of falls and reduce injuries from falling. At Cambridge Memorial Hospital, we have included falls preventions strategies in many of our programs, including our Women and Children’s program. This is part of our commitment to safety and quality care for all of our patients. One of the many strategies we have in place to reduce falls in our organization is to screen patients for falls risk and to visually identify patients at risk for falling. If you or your loved one are found to be at risk for falls, you may be asked to wear a yellow armband. A yellow armband signals to our staff and volunteers that this person may need additional assistance at times. There are many resources available in the community for patients who have fallen or have a fear of falling. Please talk to your health care provider to learn more. The “Assessment and Management of Pain” Guideline supports best practice for assessing and treating pain. This includes routine pain assessments, timely interventions, and follow-up. Below are some resources about pain management. This guideline directs the screening and identification of delirium, dementia, and depression in older adults. These are sometimes called “the 3 D’s”. Delirium is a quick-onset or sudden change in behaviour. This person may be overly sleepy or slow, or the person could be very active and confused. The person with delirium may have a hard time paying attention and could be very forgetful. This state is often associated with an acute condition, such as an infection or dehydration. Delirium can be very serious and the underlying cause needs treatment. Dementia is a slow, progressive change in behaviour. This person may have difficulty remembering recent events and may become lost easily. The person with dementia may also have difficulty problem solving or making sound judgments, such as going outside in the cold without a coat. Dementia may get worse over time, but early diagnosis and treatment can help improve outcomes. Depression can happen slowly over time or very suddenly. It can last a short or long time, and may even disappear and come back again. The person with depression may feel hopeless, helpless, or even worthless at times. They may have difficulty concentrating and may have changes in eating and sleeping habits. Frequently people with depression lose interest in things they used to enjoy as well. Depression can be helped in many different ways, including counselling and medications if needed. It is important to talk to your health care provider if you have any concerns and to seek immediate attention as necessary. This guideline promotes the safe use of restraint alternatives. We have instituted a least-restraint policy in our organization to use restraint alternatives wherever possible. The Canadian Pediatric Society, Health Canada, and the College of Family Physicians of Canada all recommend that breastfed babies receive breast milk only for at least the first 6 months. In support of this practice and to improve breastfeeding outcomes for mothers and infants, we have implemented the Breastfeeding Best Practice Guideline. Postpartum depression can occur in the first year after childbirth, and may include feelings of hopeless, worthlessness, and a lack of interest in a newborn child. It is important that women experiencing these feelings follow up with their health-care providers. This guideline includes assessment and treatment of women experiencing postpartum depression symptoms. This guideline is part of our commitment to safe, quality patient care. Pressure ulcers, or “bed sores”, can occur when the skin breaks down from periods of pressure. This guideline includes screening patients to identify those at risk for this to occur and interventions to prevent this skin breakdown. These interventions include special positioning aids like pillows and wedges, as well as frequent repositioning for patients who are unable to move themselves in bed. This guideline includes recommendations of how to identify and treat mild to significant pressure injuries and pressure ulcers. In the beginning, pressure injuries may only be reddened areas on boney areas, such as heels and tailbones. If the pressure continues without time to heal, these areas may open and become ulcers. Factors such as nutrition, age, moisture, and weight will impact how quickly this can happen, as well as how quickly pressure ulcers may heal. More information and various resources are below. This guideline includes best practices for different types of intravenous lines, or IVs. The most common types are called peripheral IVs, but there are other types as well, called CVADs (Central Venous Access Devices). CVADs include ports and PICC lines and are used for longer times than a typical IV. More information and resources are below. This guideline involves education and approaches to support people in our community to quit using tobacco products such as cigarettes. No smoking is permitted on hospital property, including outdoors. Inpatients have the option of nicotine replacement therapy free of charge during their hospital stay with a physician order. There are many resources available throughout the community for those interested in quitting smoking. See below for links and more information on this guideline. Chronic Obstructive Pulmonary Disease (COPD) is a chronic condition where someone has difficulty breathing. Dyspnea means shortness of breath, and it is a key symptom for people who live with COPD. This guideline has recommendations for nurses to support patients and families with COPD. This guideline promotes better control of adult asthma symptoms to support a better quality of life for adults living with asthma. The goal is to support patients to reduce the incidence and severity of asthma attacks wherever possible. This guideline supports the nursing care of children living with asthma. This guideline includes education, assessment, and treatment information for nurses to support best practice asthma care. This guideline promotes the primary and secondary prevention of hypertension, or high blood pressure. Recommendations of the guideline include supporting patients to achieve and maintain a healthy lifestyle as well as assessments for monitoring hypertensive symptoms. High blood pressure is known to contribute to heart disease and stroke so it important to see your primary health care practitioner regularly. This guideline outlines recommendations for nurses to support adult patients who are dependent on insulin for diabetes management. This includes maintaining a healthy lifestyle, monitoring blood sugars, and administering insulin by injection. The Crisis Intervention guideline was initially developed to support Mental Health practice, but has applications in all healthcare settings. This guideline supports professional nursing care and developing an understanding of crisis situations. This guideline is one of the Healthy Work Environment (HWE) Guidelines developed by the RNAO. This guideline supports the development and maintenance of professionalism in nursing. Professionalism includes knowledge, a spirit of inquiry, accountability, autonomy, advocacy, innovation, collaboration, and ethics. Our commitment to best practice includes regular staff education, updates, and opportunities for staff to provide feedback on each of the Best Practice Guidelines (BPG). Our focus for the future is on sustaining and enhancing our current compliment BPG’s, as well as implementing new BPGs. The Best Practice Spotlight Organization strategy supports Cambridge Memorial Hospital in creating innovative approaches to care through Community partnerships.